TS/ Telangana State Employees Incentive Scheme (TSEIS) Awards 2017 Notification Guidelines, Online application Apply @http://awards.telangana.gov.in/tseis/. 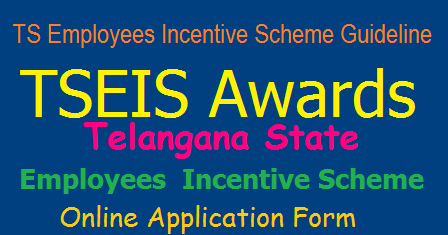 How to Apply TS Employees Incentive Scheme Awards Online Application Form 2017, TSEIS Awards Online application form Incentive Awards to TS Employees Incentives to the TS Government Employees Telangana State Employees Incentive Scheme(TSEIS) Online Application Form at awards.telangana.gov.in. Telangana State Employees Incentive Scheme (TSEIS) Awards 2017 notification of Incentive Awards to TS Employees, Incentives to the TS Government Employees, Telangana State Employees Incentive Scheme(TSEIS) Guidelinnes http://awards.telangana.gov.in Incentive Awards to Employees under Telangana State Employees Incentive Scheme(TSEIS). The Government of Telangana has decided to introduce Incentive Scheme for Telangana Government Employees as a recognition to the outstanding work done by them. The Incentive Scheme is open to regular government employees who draw a salary from the treasury and belong to any of Class IV to Class I / Group I categories working at different levels starting Gram Panchayat to State offices. There will be one incentive for each of the four categories of employees for each district taking the total number to 124. Additionally, eight more employees will be selected at State level– four in the Heads of Departments and four in Secretariat. All the 132 selected employees will get an entry of appreciation in the service record, one increment for one year and a letter of commendation. Out of the 132 employees, twelve best will be selected i.e. three employees under each of the four categories. The top three employees in each of the four categories will be given a cash incentive of Rs. 5 lakh, Rs 3 lakh and Rs 2 lakh in that order. TSEIS Telangana State Employees Incentive Scheme Guidelines-Online Application Form @www.telangana.gov.in The Government of Telangana has decided to introduce Incentive Scheme for Telangana Government Employees as a recognition to the outstanding work done by them. The Incentive Scheme is open to regular government employees who draw a salary from the treasury and belong to any of Class IV to Class I / Group I categories working at different levels starting Gram Panchayat to State offices. There will be one incentive for each of the four categories of employees for each district taking the total number to 124. Additionally, eight more employees will be selected at State level– four in the Heads of Departments and four in Secretariat. All the 132 selected employees will get an entry of appreciation in the service record, one increment for one year and a letter of commendation. Out of the 132 employees, twelve best will be selected i.e. three employees under each of the four categories. The top three employees in each of the four categories will be given a cash incentive of Rs. 5 lakh, Rs 3 lakh and Rs 2 lakh in that order. One Incentive for each category (Class-IV, Class-III, Class-B/Group-II and Class-I/Group-I) of the employee at the district level will be given. For 31 districts of the state total number of incentives will be 31 X 4 = 124. There will be eight more incentives - @ four each in the Heads of Departments, Secretariat respectively. This will make the total number of incentives to 132. If applications not received for any of the category the same may be treated as nil. Telangana state employees incentive is for the individual employee. All regular Government Employees, Last Grade to Group-I Service, whose salaries are paid directly from the Treasury are eligible to apply. For the incentive scheme employees have been categorised into Four Categories, Class-IV, Class-III, Class-B/Group-II and Class-I/Group-I. All applications for the incentive shall be submitted online through www.telangana.gov.in. All the details of the application form must be filled as per the instructions contained therein. Application with incomplete /insufficient details shall not be considered. It is a self application by Individual employee, If an employee is not familiar with online system he can take help of other persons to file application online. The applicant has to mandatorily upload recommendation in the prescribed format from the immediate officer under whom he/she is working. However applicant can also get second (2nd) additional recommendation/ reference from any other superior officer including the transferred/retired under whom he/she has worked during the assessment period. The second recommendation/ reference is optional. Recommendation has to be uploaded online. One employee will submit one application only. For example employee has got promotion from one category to another category in the assessment year, he/she can apply only for one category as per his/her preference. Employee, against whom charges / CCA Proceedings are pending, will not be eligible to apply. The Committee should ensure that there is no Disciplinary/Vigilance cases are pending against an employee who is selected for the incentive. A recommendation letter to this effect should be given. The Committee should verify his or her past record before selecting the incentive so as to ensure no body unworthy gets selected. An employee will get only one incentive in one particular category. For example if an employee gets an incentive/award at Class-IV level in one particular year, he/she will not be eligible to file nomination for the incentive next time under the same category. Employees all the four categories working in different Heads of Departments and secretariat will apply online. In all matters pertaining to the incentive the decision of the district /state scrutiny committee shall be final and binding. The nomination for the employees incentive @ 4 for HODs / Secretariat respectively will be received processed and putup for selection to the State Level Scrutiny Committee by the incentive cell of GA(GPM&AR)Department. Please Click Here to read Scheme Guidelines before filling the Application. Please tick the chech box to view the Application Form. These incentives shall be presented on the Independence day. Telangana State Employees Incentive Scheme Award Guidelines Online Application Form @ telangana.gov.in, TS Employees Incentive Scheme Awards Model Online Application Form 2017 TSEIS Selection Process, Eligibility of TS Employees Incentive Award Instructions Download at telangana.gov.in.